Kevin Pietersen recently played the 100th test of his career. It took him 8 years and 4 months to reach the 100 test landmark, just a month short of the record held by Andrew Strauss, who reached the landmark in only 8 years and 3 months. The current England captain, Alastair Cook, will play his 100th Test at Perth, which will be the third test of the ongoing Ashes series. Cook will surpass his former captains and become the only man in the world to reach the landmark in less than 8 years. It would have taken Cook 7 years and 9 months to play 100 tests. Those figures suggest that these English players play 12-13 test matches in a year. Michael Clarke will also play his 100th test at Perth, making it a unique scenario where both captains of the opposing teams would be playing their 100th test. Clarke will reach the landmark in 9 years and 2 months, implying that he's played approximately 11 tests a year. Pietersen, Clarke, Cook are considered as the leading test batsmen of this era, along with the likes of Hashim Amla, AB De Villiers, and Kumar Sangakkara. When I say this era, it is the one after the era of Sachin Tendulkar, Ricky Ponting, Brian Lara, and Jacques Kallis, whose careers are over (or about to be in the case of Kallis). I wonder though how much the English and Australian batsmen have benefited from playing a large amount of test cricket. 11-13 tests a year is a lot of test cricket. Ricky Ponting played less than 10 tests a year during the course of his 17 year career. In comparison Sachin Tendulkar played only 8 tests a year. Brian Lara also played 8 tests a year, while Kallis plays an average of 9 per year. The worst possible case however, is that of Younis Khan, who made his debut in 2000 - 13 years and 7 months ago - and has till date played only 86 tests, i.e. less than 7 tests a year. That is due to a combination of the low number of tests that Pakistan plays, team politics, and Younis Khan's own erratic behaviour. Whatever the reasons, one must wonder where Younis Khan would have been today had he played as much test cricket as Cook, Clarke, and Pietersen. 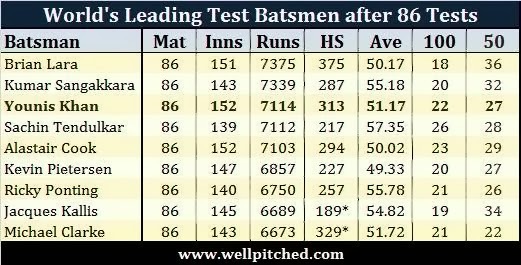 A comparison of all the above mentioned batsmen after 86 test matches, the amount that Younis has played till date, shows that only Lara and Sangakkara scored more runs; only Sachin, Ponting, Kallis, Sangakkara, and Clarke (marginally) averaged higher; only Sachin and Cook scored more centuries; and only Clarke and Lara have a higher personal score. Can you imagine how many runs Younis would have scored had he played as much as Sachin, Ponting, and Kallis? 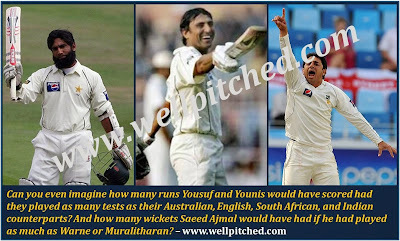 The three players have played double the amount of tests than Younis had. Sure they have had longer careers, but in Kallis' and Ponting's case, only 4-5 years longer. 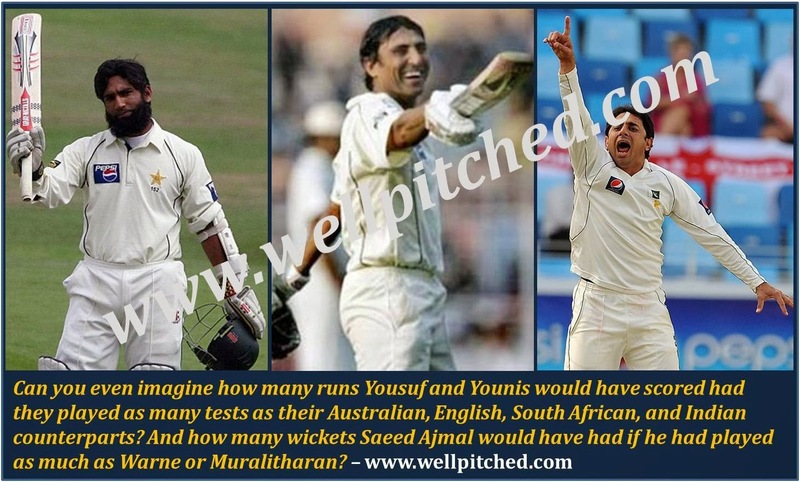 Even if Younis plays for another 4-5 years he would not get to 160 odd test matches. Hell it would take him another 2 years to get to a 100 tests! Younis Khan reached 7,000 test runs in 147 test innings. Faster than Pietersen, Clarke, and Cook got there; and only 1 innings later than Lara, and 2 later than Ponting. The likes of Sachin, Sangakkara, Dravid, and even Sehwag and his country man Mohammad Yousuf got there significantly faster (7-10 innings lesser) but it tells you where Younis Khan stands. Above the current batting greats, and at par with the all the modern day batting greats. No Pakistani test batsman has scored 10,000 test runs. The fastest batsmen to reach 10,000 test runs are Sachin, Lara, and Sangakkara, who got there in 195 test innings. Ponting took 196, Dravid 206, while the comparatively slower to that landmark include Steve Waugh who took 244 innings and Chanderpaul who took 239. Javed Miandad, Pakistan's leading test scorer, did not even bat in 190 test innings in his career. Inzamam batted in 200. There is no doubt that Pakistan's players suffer due to a lack of test cricket. Not only from creating records, but also from gaining more experience in the format. It is no secret that the more you play they better you become. How will our batsmen ever learn if they don't play enough? Younis Khan is not the only batsman from Pakistan whose career can be tagged as "what might have been"; Mohammad Yousuf is also in a similar position. Again it is a combination of Pakistan's test schedule, team politics, and Yousuf's own doing that he didn't play more or longer for Pakistan. That record after 86 tests shows that Yousuf was well ahead of the pack of all batting greats. Only Sangakkara and Lara scored more runs in that many tests, and only Sachin scored more test centuries. Yousuf's career ended after only 90 tests played over a period of 12 years and 6 months. That included a year of no test cricket for Pakistan, right after the year when Yousuf had surpassed Sir Viv Richards' record of the most test runs scored in a calendar year. Pakistani batsmen are not the only ones who have been impacted by the low number of tests played by them; the bowlers have too. Saeed Ajmal started his test career very late. He played his first test 4 years ago, a few months before his 32nd birthday. Since then he has played only 30 tests; only 7 tests a year. He would have played another 20 in this time if he were from Australia or England. Comparing Ajmal to other leading spinners in test cricket after 30 years shows that no other spinner even got close to the number of wickets Ajmal has taken; only Swann had a better strike rate; only Warne and Kumble had a better average; and no one picked up as many 10 wicket match hauls. Can you imagine where Ajmal would have been had he played as much as Swann? Or where he would have ended if he played as many tests as Warne, Kumble, and Murali? I can understand that some teams, including Pakistan, don't get their fair share of test cricket according to the FTP that is drawn up by the ICC every few years. They haven't played a 5 test series since 1992! I also know that financial constraints make PCB schedule more ODIs on tours than test matches. But are these reasons good enough to deny promising players from being considered as world's greatest? They surely could have been. It is a mixture of reasons why the likes of Ajmal, Younis, and Yousuf have not played as much test cricket as they ideally should have, but the foremost reason is the bad management controlling the PCB. Till the board is sorted out and stronger leaders start to represent Pakistan on the global stage (for cricket and other things), players will continue to be impacted adversely.